Politicians love crowds, & crowds love Flutter FETTI® political rally decorations! Flutter FETTI® is proudly Politically American. At political rallies across the political spectrum - including both the Democratic and Republican conventions - help delegates and supporters cheer on their parties, boosting volume levels and giving campaigns momentum. For state and local races, too, Flutter FETTI® political rally decorations get everyone excited and add an extra zing to victory celebrations. Show your supporters how much you appreciate them, and make your political rallies fun with our election confetti! Flutter FETTI® is an explosion of patriotism. Choose from a wide variety of effects from Corkscrews or Starburst Streamers; filling a convention hall with a shower of Flutter FETTI® election confetti will create a fantastic, jaw-dropping effect. Our continuous flow gerb confetti launchers, which are for rent or for sale, send out a continuous stream of Tissue and/or Metallic Flutter FETTI® confetti, one pound per second as high as 100 feet in the air! 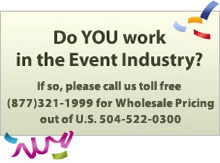 Handheld Confetti Launchers can send dazzling 2" X 40' long Metallic Streamers up to the ceiling. Distribute our amazing, airless hand flick election themed confetti launchers around the political venue to allow your supporters to take part in the confetti throwing themselves. These launchers can be customized with candidates' names and with red, white, and blue confetti. At Flutter FETTI®, we're doing our part for democracy.